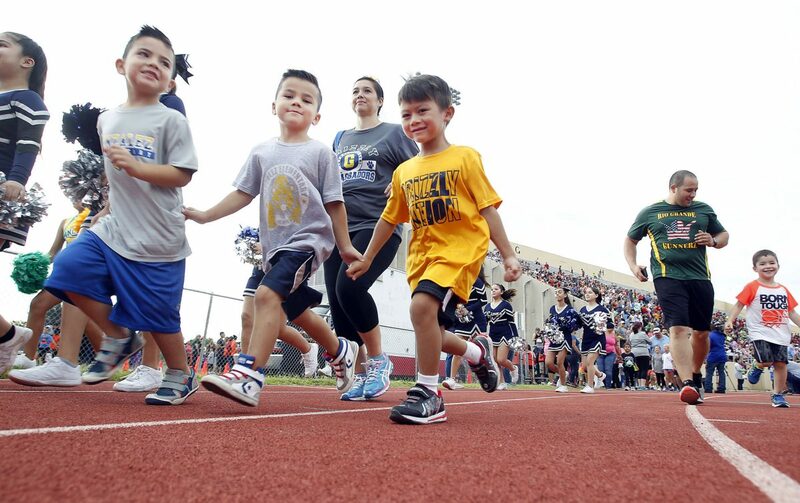 Participants complete their laps at the Fourth Annual McAllen Kids Marathon on Saturday Sept. 9, 2017, at McAllen Veterans Memorial Stadium in McAllen. 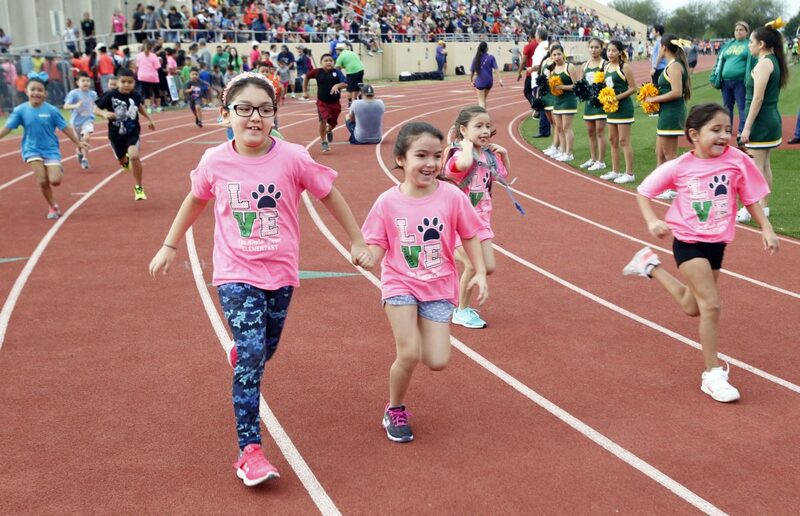 McALLEN — Students from across the McAllen school district and beyond who may normally sleep late on weekends were up early Saturday as they began the first leg of the fourth annual McAllen Kids Marathon at the Veterans Memorial Stadium track. As an estimated 5,000 participants gathered, many pumped with adrenaline, they heard from Keith Davis, a former NFL player for the New York Giants, one of two motivational speakers for the event. Davis was also a collegiate athlete for the University of Southern California whose team won two Rose Bowls. “Sight is a function of the eyes; vision is the function of the heart,” Davis said, encouraging them to keep moving forward in their education. He also urged the students, ranging from kindergarten to eighth grade, to be active and to stay focused on their education. Davis spent the day on Friday visiting several McAllen schools to deliver a motivational message that had him reminding students that life, like a football game, has two halves. The first half, he said, may be filled with setback and even misery — much like his own life — but the second half allows students to accomplish their dreams. Children from various schools in McAllen take off running during the McAllen Kids Marathon on Saturday Sept. 9, 2017, at McAllen Veterans Memorial Stadium in McAllen. 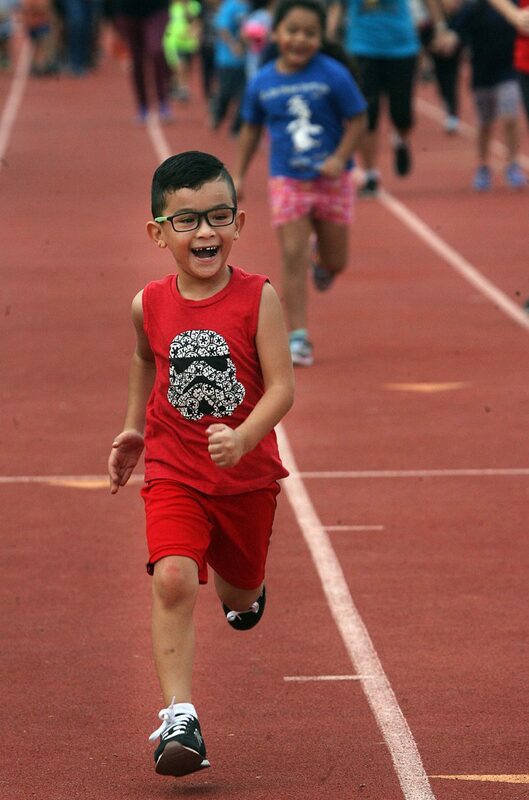 Children join in the 4th Annual McAllen Kids Marathon on Saturday Sept. 9, 2017, at McAllen Veterans Memorial Stadium in McAllen. The McAllen Kids Marathon is an annual event in which thousands of area children run the equivalent of a marathon — 26.2 miles — over several weeks. Saturday marked the kickoff mile, which is run as a community. Each week, children will log additional miles, either through school activities or with their families, until a final community run is scheduled for Jan. 20, a day before the McAllen Marathon Scott Crane Memorial Run, which begins at the McAllen Convention Center. 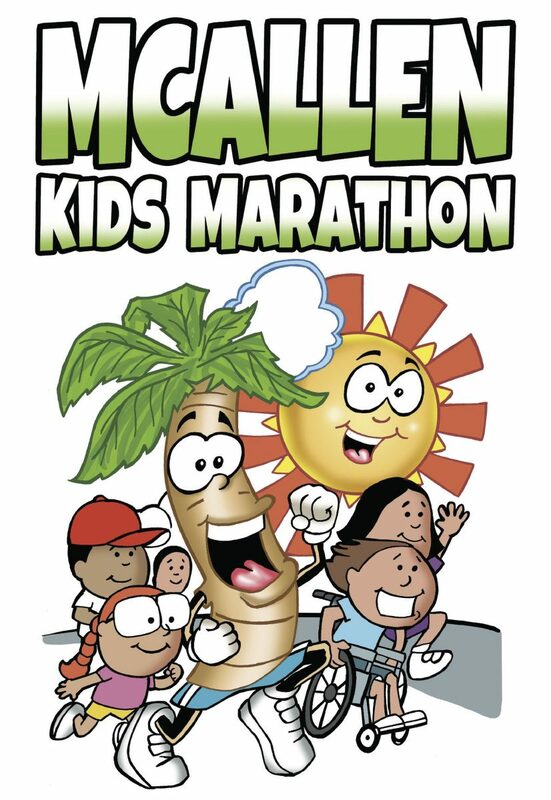 The Kids Marathon is co-sponsored by The Monitor; McAllen Independent School District; the city of McAllen; Telemundo40; Rio Grande Regional Hospital; United Healthcare; the University of Texas Rio Grande Valley; and Texas A&M Healthy South Texas. “The idea of the Kids Marathon is just to kind of encourage the kids to complete a marathon, and if they complete a marathon, they can complete anything in life,” said Sandra Sanchez, McAllen Kids Marathon race director and opinion editor for The Monitor. McAllen ISD Superintendent J.A. Gonzalez was on hand to cheer on the elementary and middle school students as they ran their mile. The wellness message will be reinforced throughout the school year, he said. “ One of the things the coaches are doing, they’re emphasizing the importance of physical fitness and also working in some of the miles into the curriculum, so as students are going to school, they’ll be capturing some of the miles within the school day, “ Gonzalez said. Sam Houston Elementary School was one of the schools that participated in the mile run Saturday and had approximately 70 students attend. Janie Ramirez, an educator at Sam Houston, said they are ready to teach health and wellness and kids are always excited about it. First-graders Victoria Cavazos and Yarely Campos said they will go to the park with their parents to complete the miles. During the event, participants and their families had the chance to meet and take photos with Davis and fellow football star Caylin Moore of Texas Christian University. Moore, who grew up in poverty in Compton, California, also offered an inspirational message of hope that was underscored by him being selected for the prestigious Rhodes Scholarship Program, which will have him continue his studies at Oxford University in England. Moore has already been accepted for a doctoral program at Harvard University when he completes his studies abroad, he said. Emmanuel Vallejo attended the run with his children and relatives who attend Wilson Elementary School and Lincoln Middle School. They were overjoyed after meeting Davis and Moore. “It was cool and exciting,” the Vallejo children expressed in awe.